"The world breaks everyone and afterwards some are strong at the broken places." Nine days ago I broke my foot. Six days ago I put my hand through a glass window, badly cutting it in the process. Granted the glass in the window was old and my hand slipped off of the wood frame, but this injury and my foot in an aircast after fracturing my fifth metatarsal have caused me to wonder about what the universe is trying to say here. There is a message and meaning to everything that happens to us in life. The answers I know will be revealed in good time. Patience, ever the virtue and something I struggle with, will win in the end. The irony is that for weeks this summer I trekked through some of the burliest country in North America in the Alaskan Interior, slashing and hacking, climbing and slipping. Yet, here not ten minutes from my homes, the simplest of twists when I was not looking where I was going changes your life in a large way. 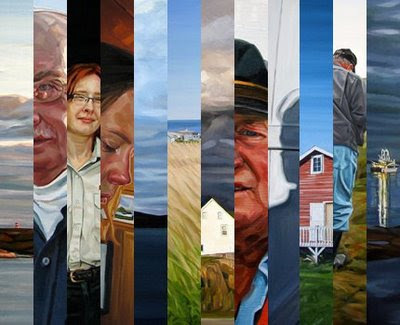 However, instead of wallowing in the situation I am trying to use the time to accomplish some solid work and continue to prepare for the Newfoundland Portraits exhibition which is now less than three months away. 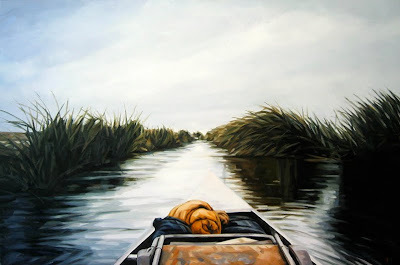 I am also continuing work on paintings based on Christopher McCandless' photographs of his odyssey around North America which will eventually form an exhibition as well, happening in either 2011 or 2012. My physician advised me to keep my cast on as often as possible and to elevate my foot frequently. I have had to devise a way to paint with my foot raised up, which is no feat (pun intended). However I think the greatest lesson that I can discern from this break, at least for now, is how much we take mobility in life for granted. I realize now that running is out of the question, that moving quickly is not in my vocabulary for the next while, how fortunate we are when we can move as swiftly as our feet can carry us. It makes me appreciate each day and each task that we can do ourselves with even more humility and gratitude. 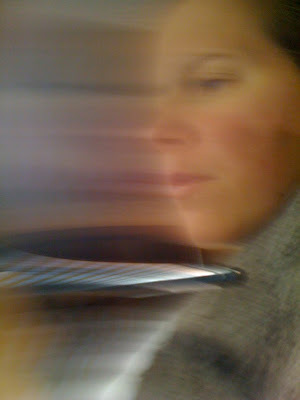 Plus, it is an opportunity to focus energy that might have been spent on other things, towards my painting. I have included a photo of the cast on the edge of my easel while I paint below. Not terribly exciting but fortunately I have a job where I can work in this condition. 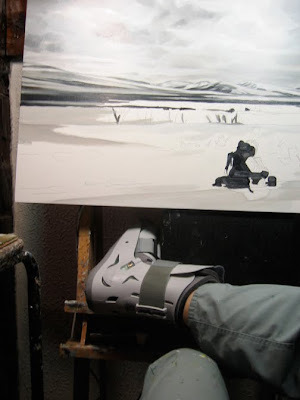 I have about five weeks left with the cast and other than learning to hobble as well as possible with this aircast my work is coalescing and paintings are being completed, new ones begun and I am thankful for the support of friends and family too. My friend Gayle brought some fresh vegetables from her garden and some homemade vegan! chickpea salad for me. Thank-you almost doesn't do justice to these beautiful acts of kindness. In terms of what is happening in the studio I will include two pictures of paintings in progress for you to see what I have been up to. This is not a great photo but you get the idea here. This gentleman is a great character and kind soul who I met while in Wesleyville, Newfoundland last September. I loved his small shed with the low door frame and asked him to stand in that space. 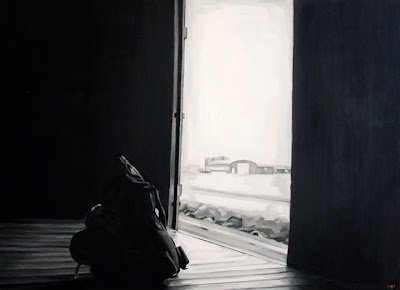 I enjoyed the darkness behind him and love to do paintings with doors and frames that are echoed in the shape of the canvas itself. Thus George posed for me for a few minutes and I am working hard to have this painting completed by month's end. This painting is one that is very near and dear to my heart. I expect to have it finished in one more solid day's work. 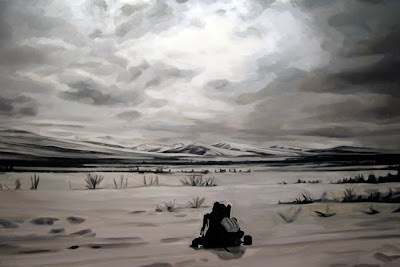 It is a painting based on Chris McCandless' photo of his backpack on the Stampede Trail in the Alaskan Interior on or around April 28th, 1992. He had just been dropped off by Jim Gallien, an electrician who gave him a lift as far as he could down the uneven Stampede Road that becomes Stampede Trail eventually. Chris would have been alone on the trail for the first time and probably his pack was the first and logical thing to take a picture of as a symbol of himself, his journey, his philosophy. There is almost an Ansel Adamsesque quality to his shot, a quality that I wanted to capture in my painting as faithfully as possible. I will post the completed painting on my other blog, Heather Horton Artwork as soon as it is finished and Chris' parents have seen it. On a side note, I am trying to start thinking about a way to make the exhibition of paintings related to Chris' life and photographs a traveling exhibit. Christopher was a traveler, and I thought how appropriate a traveling exhibit would be for such a peripatetic man, a beautiful soul who turned thought into action and his incredible odyssey is a testament to that philosophy. I am sure Chris would agree with Henry David Thoreau, a hero of his, to "not lose hold of your dreams or aspirations. For if you do, you may still exist but you have ceased to live." 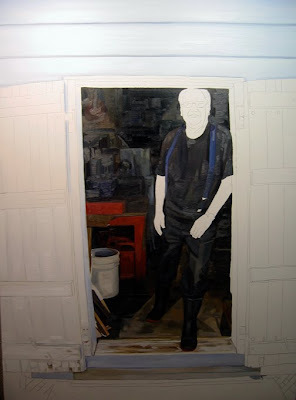 Therefore if anyone reading this blog entry has any ideas about publicly or government-funded galleries looking to exhibit these paintings about Chris' life and journey, please send me a message. I would like to start planning this exhibit now, because the time to show them will arrive soon! Here are some other paintings I have done based on Christopher's photographs so far. 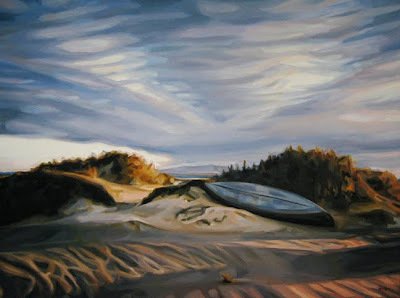 "Chris' Canoe, Near Golfo", oil on panel, 18"x24"
"To The Sea", oil on canvas, 24"x36"
"We could never learn to be brave and patient if there were only joy in the world"
Here is some information on my solo show, Portraits Of Newfoundland. This exhibit will focus on the beautiful people and places I encountered on a journey there last September. I hope to see you at the opening! I know exactly what you are going through. In Dec. 2002, I slipped on the ice while running and chipped a bone in my hand, the following month, I broke my 5th metatarsal while jumping off a snow bank. I was laid up in that cast for a total of 7 months. I have since a greater appreciation for mobility and freedom of movement. Bon courage in your recovery period. I'm glad you can find the bright side of your injury, there always is one and as you said, sometimes it's not readily or easily seen. got your link through my FBF Barry Johnson. told me to check you out in a couple of galleries. I'll pop by Hazelton lanes sometime in the next couple of weeks. Good Stuff. and your blog is pleasing to read. I didn't even know that you hurt yourself.. Well, it's been a few months and I hope you're better. I wrecked my ankle in the simplest situation with my boys at the park and I too had spent many months trekking in risky situations, with no problems, then when you're home, I guess the guard comes down or something. I learned about the 'simplest movements' etc as well, at the time I was publishing a bi-weekly paper. I always enjoy dropping by and gobbling up your images and words. Be well. B.